In the photo, MHBS members join fellow diners during the recent club trip to Japan and Asia. On the domestic front in July, MHBS will host guest artist Young Choe and a presentation on bonsai accents, and the club will visit Martin Schmalenberg’s Garden and Nursery. August 25th is a one-day MHBS club show at Proctors Theatre in Schenectady, open to all, and a great time to view bonsai and ask questions. In September many club members will head to the National Bonsai Exhibition in Rochester, highly recommended. And in October, we’ll create some bonsai rock plantings. It’s a great time to style certain trees and with perfect timing, Martin Schmalenberg is dropping in to help. On Sunday, November 13, Martin will be on hand to work with you on designing your trees, $50 for the day-long workshop that begins at 9:00 AM. 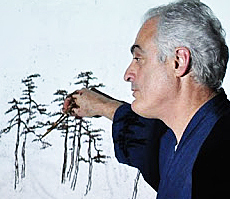 A noted bonsai teacher, Martin studied in Japan with Hiroyoshi Yamaji and Mikio Oshima, and in the states with Nick Lenz, Boon Manakantivipart and many others. We are fortunate to host him regularly at pfm bonsai. Bring your trees,tools, wire and lunch. RSVP while space remains to pauline@pfmbonsai.com or 518-882-1039. The first Marty Schmalenberg study group was a big success with attendees, and many trees came away with a solidly improved design path. Now we’re seeking increased club participation to ensure that we can continue with these monthly design immersion workshops. February’s dates are still to be determined so contact Pauline immediately at 518-882-1039 or pauline@pfmbonsai.com if you’re interested. You may sign up for the two-day weekend or just one day. Bring as many trees as you wish as we discuss and study member trees, followed by a hands-on design workshop with Marty. If you are ready to take your design to the next level, this workshop with one of the discipline’s top designers is a fantastic opportunity to make the leap from pretty trees to specimen trees. Here’s a rare opportunity for serious students to study with a bonsai master on a monthly basis. Beginning January 19-20, Martin Schmalenberg will conduct comprehensive weekend workshops in our newest study group. If you’re ready to take the next step in bonsai development, learn more before this study group is filled, and watch your trees become specimens. Fall and winter are the time to work on pines and we know these trees demand a special skill set. Who better to learn from than a guy whose pines keep winning awards? Martin Schmalenberg’s pines win lots of them and during his all-day Pine Immersion Workshop on November 4, he’ll show us how he does it. The day begins with Marty’s comprehensive lesson on pines, followed by personal consulting and help with your trees. Bring a lunch, tools and wire, and one or more of your pines to work on, or select one from PFM Bonsai or Marty’s workshop trees. The Pine Immersion Workshop is $90 and runs from 9am to 4pm on Sunday, November 4 at PFM Bonsai in Charlton. To register, call 518 882 1039 or email Pauline Muth at Pauline@pfmbonsai.com. Checks should be made out to Martin Schmalenberg.